The following summary was released by the Office of the Director of National Intelligence July 1, 2016. The assessed range of non-combatant deaths provided to the DNI reflects consideration of credible reports of non-combatant deaths drawn from all-source information, including reports from the media and non-governmental organizations. The assessed range of non-combatant deaths includes deaths for which there is an insufficient basis for assessing that the deceased is a combatant. 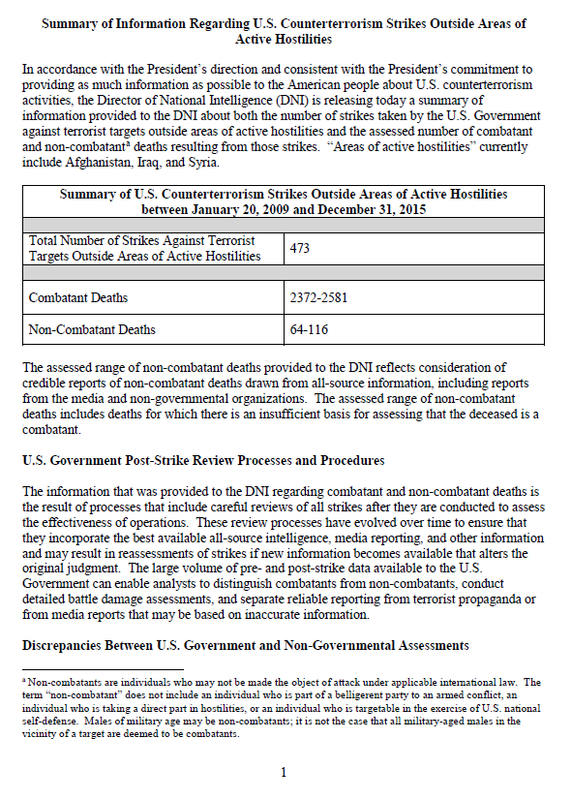 The information that was provided to the DNI regarding combatant and non-combatant deaths is the result of processes that include careful reviews of all strikes after they are conducted to assess the effectiveness of operations. These review processes have evolved over time to ensure that they incorporate the best available all-source intelligence, media reporting, and other information and may result in reassessments of strikes if new information becomes available that alters the original judgment. The large volume of pre- and post-strike data available to the U.S. Government can enable analysts to distinguish combatants from non-combatants, conduct detailed battle damage assessments, and separate reliable reporting from terrorist propaganda or from media reports that may be based on inaccurate information.